The Friends of Oasis committee continue with their incredible fundraising events in support of our clients. Recent events include a guided walk around Quex Gardens raising £250 and their 4th lunch at The Yarrow Hotel. This year 110 guests were treated to a 3 course lunch, beautifully prepared and served by the students. 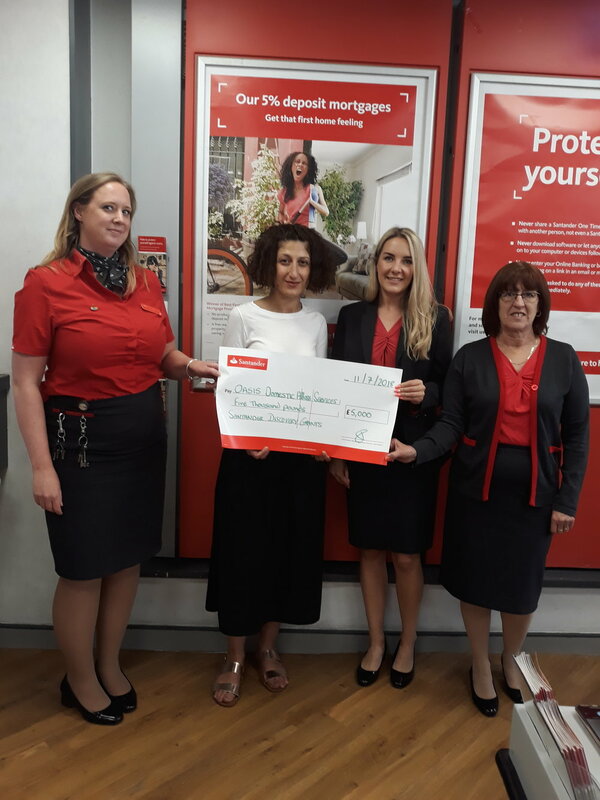 Also present were staff from Santander’s Margate branch who kindly match-funded the event, bringing the total raised to £2,997.00. Thank you to the residents of Darwin Court who raised £1,000 for Oasis through a variety of events throughout the year. We are so thankful for your support. We were delighted to have been chosen as the local charity of the Margate Operatic Society at their AGM. Thank you for the kind donation of £300. Thank you Dreamland for choosing Oasis as one of your charities supported by your summer Variety events, £150 was raised through a collection and a raffle and the night was a huge success. David & Rebecca from Broadstairs Chiropractic Clinic hosted another fundraiser for Oasis with a guess the baby weight competition. Thank you to your customers for raising £130 for Oasis and congratulations on the arrival of your baby girl. Massive congratulations on running your first ever marathon, first half iron distance and a grueling 100 mile bike ride in the rain! We are so grateful for your support. We were so grateful to be one of the charities chosen by Tilly, Janice and Josh who walked the length of the Thames in lots of rain and wind (and a little bit of sun) raising £1,012.38 for Oasis! We are thankful for all of the hard work you put in to fundraising by organising bake sales and a quiz and curry night. Thank you Tristan Honeyborne for going all the way to Alaska (!) to run your first marathon and for choosing Oasis as one of your charities. We are so thankful for the £308 you have raised. Huge thank you to Kerry Crossley and friends for taking part in The Colourthon walk around Southend by night. We are so grateful for the £272 you raised, and we hope you had fun by the seaside! Thank you Tyrone Austin for raising £456 on the 100km walk from London to Brighton and for dedicating this challenge to our mutual friend and colleague Aimee-Jane Connell. With your help we can continue helping families affected by abuse. Thirteen 16-17 year olds took part in a sponsored walk from Dreamland to Viking Bay and back, a sponsored cycle and a pub quizraising over £700 for Oasis. Thank you for your enthusiasm and dedication to raising awareness about domestic abuse. Thank you to the North and South Thanet Conservative Associations for donating £365.00 from your Red, White and Blue Ball. The cheque was presented to Claire Fenley, Community Fundraiser by Lynne Conolly, Sam Bambridge and Carol Messenger. Thank you to The Santander Foundation who awarded us a £5,000 grant as part of their Discovery Project. This money will go towards our Blossom Project which offers support with employability and obtaining skills for life. 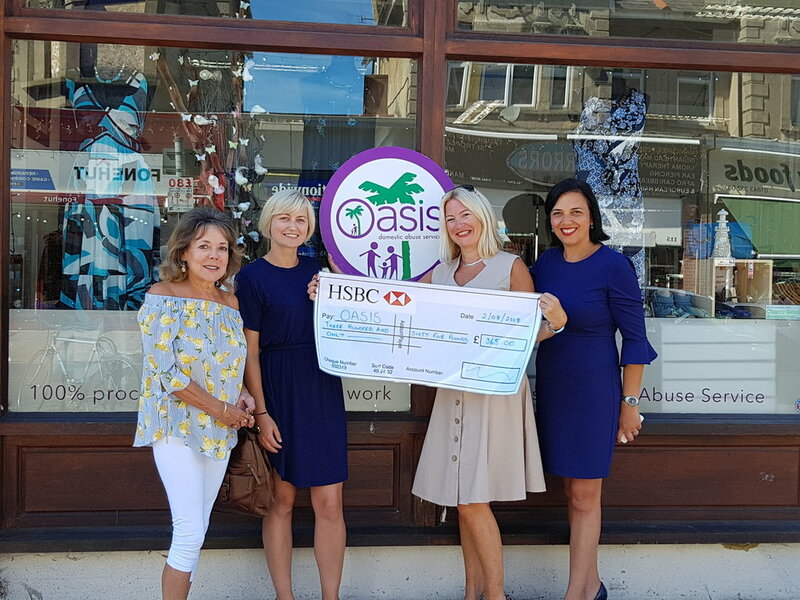 The Oasis golf day on Friday 15th June at North Foreland Golf Club has raised over £10,000 for Oasis Domestic Abuse Service. A total of 80 players took to the fairways for a shotgun start, following coffee and bacon rolls in the clubhouse, and played 18 holes in the sunshine on North Foreland’s beautiful course. The headline sponsor was Rotary Club of Thanet. On course, players were treated to whiskey and champagne, served by event sponsor Artemis Recruitment on the 10th Tee, while a Mini convertible, donated by Barretts Group of Canterbury , advertising auction prize 'Win a Mini for the weekend' was on display on the 18th Tee. Taking first place was Trevor Brown's team with a score of 90 points with the Team captained by Jane Pace coming not far behind in 2nd with 88 points. In 3rd place was Ann Gardner's Team with 87 points. Lee Hack hit Nearest the Pin on the 7th hole and Jill Lamerton was Nearest the Line on the 10th. All winners received golfing prizes generously arranged by club professional Darren Parris, presented by Club Captain Stuart Barr and sponsored by Lanes Printers of Broadstairs. In the evening, guests were treated to a 2 course meal with live music from Paul Messenger, aka Onelove , which was followed by an entertaining charity auction expertly run by Club Chairman Mike Bastow and Former Chairman Keith Rumblo. All of the funds raised through the auction and raffle were generously matched by Barclays Bank, whose staff also attended, helping to boost the charity pot and raise extra, valuable funds for those affected by Domestic Abuse. The event was well-supported by local businesses, 18 of which sponsored tees on the course. Speaking on behalf of Headline Sponsor, The Rotary Club of Thanet, Neal Elliott said, "Over the years the Rotary Club has raised considerable funds for Oasis through their annual Boxing Gala which is held in collaboration with the Ramsgate Boxing Club. We were delighted to be the main sponsors of the Oasis Golf Day 2018, which through the tireless work of the organising committee has been a sell-out, and a guaranteed success"
Jodie Nesling has raised over £1,600 (!) by running the London Marathon for Oasis. Read her heartwarming and humorous account of the day below. I trained in arctic conditions with a body built for writing and drinking but I ran the London Marathon for charity in searing heat - it is one of the best things I have ever done and below is a brief account. My mum and sister suggest I should ‘carb up’ so order a massive chinese. A reminder of when one my best friend Genevieve lovingly received a KFC bucket after a horrendous labour: both not advisable but well-intentioned. I don’t feel nervous. Fitness trainer Jason Turner who has broken me with kettle bells has been positive and encouraging, I feel I can take on the world...and a chinese. I’m sunburnt, emotional and hitting the wall; this is before getting off the train at Stratford. I meet a group of runners on the Jubilee Line. We chat like you never do on the tube: one young woman secured a marathon place through the ballot, she is cheerful and wearing energy gels around her waist like a nightclub shot-girl, she is also wearing a Macmillan sponsorship top. I ask why she is running for a big charity. “My dad died six weeks ago,” she replies and hangs her head so long plaits swing forward. These are the first tears of the day, the first hugs and the first time I think this experience with strangers is a social anomaly that should be celebrated with every fibre of our being. After about a three-mile walk to the starting pen (cheeky swines!) the melee share anticipation, nerves and camaraderie. I make friends with a giant apple and tell him I have lost my tracker. I glance to see if anyone else has. They haven’t, not even the apple. I reach the starting line at 11am conscious my running mate Mo will be at the halfway point. I step over the line undramatically and start to run. I feel good. This is a piece of piss! I am head-to-toe in black and the sun beats down without respite. There is no breeze and no shade. I know without checking that this will be the hottest marathon day on record. I can’t cool down. The miles go by and the crowd blare out DnB, hold out banners, cheer my name and high-five as I go past. Somebody manages to get a horse to stand on something and poke its head over a fence. Do I have heat stroke? Running over Tower Bridge is mesmerising -being part of the bobbing throng of costumes, trainers and sweat at the heart of our beautiful capital is an unforgettable moment... but realising you are only half way is also pretty tough. Docklands follows and is very hard. But again, testament to this race, it is as if by magic, I bump into a friend. The weird thing is I do not see Kirsty at first but recognise the face on the poster she is holding from Facebook (her friend who tragically died of cancer). I look up and see Kirsty, looking impeccable in a summer dress, I wipe all my sweat over her and carry on, she doesn’t mind. The atmosphere is insane. I can’t get my head around it. I see Kate and John again. I am struggling and overheating. A stranger gives me a bottle of water. It is too painful to walk so I keep running, I am exhausted from the heat, my back which gave way before the race, is in agony. I seriously want to give up. Someone offers me a sausage roll (see comments on chinese and KFC.) Three boys give me ice to put on my neck. I want to cry. At mile 21 a remarkable thing happens: the second wind. I have many of these on drinking benders but never running. The utterly brilliant, brilliant, brilliant (yeah it deserves three) running club, Run Dem Crew are stationed at Whitechapel. They have been there for hours and are partying and shouting names like it is the first five minutes. They are shouting my name. It is immense and then The Proclaimers start to blare out. I think to myself, I will walk 500 miles. I will do that, ok I will…. it carries me. This moment is pivotal, transcendental, second wind, second coming...I am running through it. It isn’t quite ‘runner’s high’ though - I am expecting psychedelia and rainbows with that. I see my family, they are all hammered outside the Liberty Bell near Tower Hill. I am too tired to stop but it was pure chance. Again. It makes so, so happy but I can’t convey it as I’m broken. I think it is mile 22 and my heart soars. The pain in my face is very visible. ““Keep going Jodie, you’re a hero!” Am I? Thank you complete stranger. I run through, I am finishing the London Marathon and in six hours (which I am pleased with) I am having an out of body experience and I am very confused but I have a medal and I can’t stop looking at it. I have a beer in the pub. I can’t walk as my legs seized up as I sat next to Nelson’s Column after the race. Friends together with a group of complete strangers give me a standing ovation and I have never felt so proud. My mum looks at me like we have won the lottery. David Bowie was right, you can be a hero….just for one day. A great big thanks to all who sponsored (some complete strangers, amazing) and supported me on the day (Kate, John, Mum, Kieron, Kirsty, Lou, Rodders, Megan, Linda..etc) Massive thanks to training legend Jason Turner for always being so proud! And Eddie Gadd, Sue Fisher, Jon Stringer and Phil Leader for Joderunner beer. It has been a privilege to raise money for families torn apart by domestic abuse but I am never doing this again! We're getting closer and closer to the fantastic Postcard Auction - the Volunteers are prepped and the Pimms is waiting to be poured for the launch party. The gallery will be open from 27th August to 2nd September 11am-4pm, come along to the Harbour Arm to get a good look at the art and soak up a bit of the Margate sun. Auction Day is Saturday 3rd September but if you can't make it on the day bidding slips will be available throughout exhibition week. Alternatively email Claire.fenley@oasisdaservice.org with the Lot number and the amount you wish to bid. The catalogue has just been released so you can get a sneak peek of all the art and find the one (or more!) for you! We're really excited to be holding the 8th annual postcard auction on Margate's Harbour Arm. Make sure you get Saturday the 3rd of September in your diaries now - it's a chance to get your hands on some fantastic bits of art and support the work we do to help people affected by abuse. We need postcard sized pieces of art to auction, they can be of anything you like but please sign them on the back, it's a secret auction! Last year we had talented artists from Thanet, the UK and as far away as India who were able to help people living in our refuge. Post your artwork to - Postcard, Oasis, PO Box 174, Margate, Kent, CT9 4GA or dropped off at “The Oasis Shop”, Margate, Kent CT9 1ES (by Friday 8th July). Remember to let us know who you are so we can pop your name in the catalogue! There's always a real buzz to the Harbour Arm on auction day - come along, have a glass of wine and go home with an original bit of artwork. You won't miss out even if you can't make it on the day - pop into the gallery to put a bid on any of the work that catches your eye during the week. We are extremely grateful to everyone who gets involved and makes this possible. Last year the auction made over £7000 with entries from Tracey Emin and Grayson Perry as well as David Cameron and Jo Brand. The money is vital to helping families overcome domestic abuse. For further information contact Dee Murphy by emaildee.murphy@oasisdaservice.org or call 07753447237. Our amazing supporters at East Kent College have been very busy lately organizing pamper days, sponsored walks and putting together gift bags. Their effort makes a massive difference to the women and children staying with us. The results are in and the anti-litter campaign ‘Bin it for Good’ has raised a tremendous £1,500 during its three months for Thanet charities. In addition to the money and awareness raised for Pilgrims Hospices, Oasis Domestic Abuse Service and Porchlight, the campaign has reduced the amount of litter dropped on our streets over the three months by an average of 35%. Each charity has achieved the maximum prize pot of £500 each due to these fantastic results. Launched at the start of September, the three month initiative, which is a partnership between Thanet District Council, The Wrigley Company and Keep Britain Tidy, aimed to change behaviour whilst turning cleaner streets into cash for charities and good causes; and it has worked. The ‘Bin it for Good’ charity pot logo was proudly displayed on designated public bins around Margate Old Town. The more litter that went into these charity pot bins, instead of on the ground, the more money the featured charity received. The scheme’s success has pleased all those involved who worked to get it launched. Cllr. Suzanne Brimm, Cabinet Member for Operational Services, said: “We are so pleased with how the public and local businesses have responded to the scheme and supported it. We have seen a positive change in attitude to dropping litter since the start of the campaign. Pictured here from left to right the photo includes Rachel van Hoven, Community Fundraising Manager, Porchlight, Loukia Michael Fundraising Manager Oasis Domestic Abuse Service, Jasmin Rose, Environmental Education Officer, Thanet District Council, Darren Scott, Cleansing Operative, Thanet District Council, Steven Hadley, Cleansing Operative, Thanet District Council and Karen Kenward, Community Fundraising Manager, Pilgrims Hospices. Frank Thorley has celebrated his 80th birthday in style with a party at The Pavilion on the Sands, Broadstairs. Over 300 guests came to wish Frank a happy birthday and enjoyed music by Ben Mills as well as a swing band and DJ. Frank insisted to his guests that he did not want any presents but that donations to his favourite charities, Oasis Domestic Abuse Service and Pilgrims Hospices would be most welcome. As a result, over £5000 was raised and the money was divided equally between the two charities. Oasis Fundraising Manager, Loukia Michael, said “We were overwhelmed by the generosity of Frank, who does so much for local good causes, and his guests who were kind enough to donate. This money will make a huge difference to the vulnerable families we support. Oasis and Pilgrims are both local charities doing vital work in the Thanet community”. Organisations from around East Kent donned their orange clothes on Wednesday 25th November our International Day for the Elimination of Violence against Women fundraiser. To help raise valuable funds, staff at Avante Care & Support’s head office in Faversham not only dressed in orange but took part in various fundraising activities including ‘guess how many orange balloons fit in a Fiat 500’ and ‘guess the weight of the cake’. Also participating were regular Oasis supporters, Boys and Maughan Solicitors, whose five offices all supported the cause. Ian Priston said, “Our staff were delighted to join in the fun in aid of a very deserving local cause and, on a serious note, we hope that the money raised helps to offer vulnerable families a brighter future”. Oasis Fundraising Manager, Loukia Michael, said “We have followed the lead of the United Nations campaign to Orange the World with this event and would like to thank Boys and Maughan, Avante and East Kent College who together raised £275 and who have also helped us to share our key message that love shouldn’t hurt.